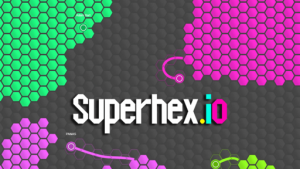 Superhex.io adds to the cerebral gameplay with great features and additions, including changeable skins when you Follow, Tweet, Like, Subscribe or Share. Become the Superhex in your map and edge out the competition! Players get a different-colored line every time they play. The head can be changed by using available Skins, i.e., you can get a Frog, Pig, Tiger, Panda, Fox and Elephant head by clicking on the lower left part of the screen. Type your Name and click on the Play button to begin. You start with a small-sized group of hex territory and a head that goes to where you point the mouse cursor. Each black hexagonal tile you pass will become potential territory when you close the loop. Loops can be closed as you get back to your colored tiles and pass through. Keep in mind that open loops can be destroyed whenever an opposing player touches any part of that line. When you die, you start over and the territory you conquered will disappear. The maps in Superhex.io aren’t very large, which means that it’s possible to meet an opposing player in just a few minutes of starting. With that in mind, it’s very easy to get your first line obliterated with a stray touch when you make too large a loop, which can be frustrating. Your best bet will be to start closing loops as quickly as possible by going small. Running around in circles provides close proximity to your base; whenever you see a player trying to invade, you can close it and they’ll be the one with the Game Over screen. The goal in Superhex.io is to be the biggest territory when all is said and done, and sooner or later you’ll be competing for valuable real estate with players on the map. When you see an open loop and a chance to strike, don’t hesitate! Aim for it using a straight line and touch it using your avatar’s head to make it disappear. But don’t just mindlessly attack as it could be a trap. Be ready at any time to swerve out of the way when you see the line form a solid hexagon. Superhex.io won’t tax your computer or laptop as it has simple graphics, so why not use this to your advantage? Crank up the Quality to High and you’ll be able to see your line, head and territory better than with Medium or Low Quality settings. Click the “Play With Friends” option at the top left part of the page then share the html link that’s generated. Have them copy the link and paste it on their browser to join your game.